figures include data on M.S.P. (military) fh`pments. adjusted figures on total exports, excluding M.S.P. (military) shipments. Seasonally-adjusted data are not available on a commodity basis. Dur$13. to p.3 mil ; .cos'.uL txcavtng, nii, . machine tools ad pa'rts, frum $. .t $27.1 rail.'on. .',. . tures, from C>.5 ti $38.1 ml li' n.
to $12.5 million; and wheat flour, from $1." to $14.8 million. June 1956, and the October-December 1959 issues of *. i' . Vegetables, fresh or dried....................... 1,000 lb..
All other manufactured foodstuffs ...................value..
'3ee footnotes at end of table. Cotton semimanufactures.................................... 1,000 lb.. 28,861 32,3 ,. value.. 4. 4. 4. /..
value.. 7.6 6.1 8.o 8.7 7. Textile, sewing and shoe machinery..........................value.. 18.5 17.0 12.3 12.9 9.
nludes 45.1 million of Military Mutual Security -.-' n shipments ($18.5 million to Western Europe). 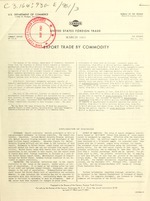 corrections in the net quantity data made subsequent to the release of the February 1961 issue of this report.